200 grams of rice , 6 crab sticks (surimi), 2 cans of tuna, 1 / 2 sweet onion Sources, dill, black pepper, flour, egg, breadcrumbs, salt and extra virgin olive oil. Chop onions very tiny and the surimi crab sticks or. Put in a saucepan or pot, a fund of extra virgin olive oil and garlic. Allow to brown. Add rice and a few laps in the oil to cook that a little. Add water and let cook for about 15 minutes. Remove from heat and let sit. If we are left with some water, drain on standing. Let cool. Place the rice in a bowl and add tuna, surimi and onion, season and add some dill, mix it well. Make balls that are not too large (24 left me with these numbers). Before frying, move each ball in flour, beaten egg and breadcrumbs. Then fry then put on kitchen paper towels to loosen the excess oil. 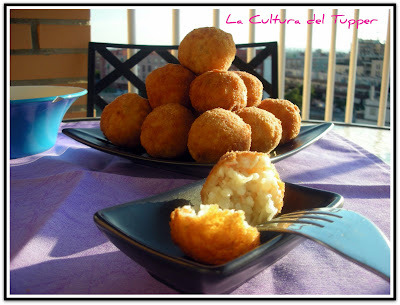 The balls of rice with tuna and surimi can be eaten hot or cold, we love it with soy sauce.